Key statistics from Crimestoppers show 575 criminals were arrested and charged. Over the last 12 months independent charity Crimestoppers has received a record number of reports from the Scottish public – as people speak up to help make streets and communities safer. New figures show the total number of calls (April 1, 2016 - March 31, 2017) were 12,233 (an increase of 21 per cent on last year) and 9,119 pieces of information were actioned by law enforcement. Other key statistics from Crimestoppers in Scotland as a result of anonymous reports include: 575 criminals arrested and charged – an increase of 20 per cent; Five people arrested and charged with murder; 14 firearms, 172 ammunition and five knives recovered; ‘Street’ Value of Drugs Recovered £1,582,612 - an increase of 161 per cent or £976,920; Value of Property Recovered £124,000 – an increase of 118 per cent or £67,375; 1,056 Positive Actions: Preventions, Disruptions, Referrals and interventions – an increase of 17 per cent. This includes, safeguarding, prevention, a referral to a support organisation, submission of a vulnerable persons report or direct intervention to stop crime that is allegedly planned and £50,000 offered in enhanced rewards. Angela Parker, national manager for Crimestoppers Scotland, said: “This is an impressive increase that shows how people are putting their trust in our charity as a way to pass on crime information whilst remaining 100 per cent anonymous. 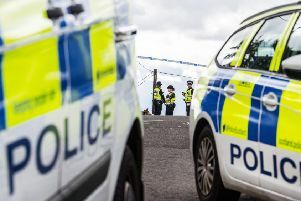 Cabinet Secretary for Justice Michael Matheson said: “Scotland continues to be a safe place to live with recorded crime down by 41 per cent since 06-07 and crime at its lowest level for 42 years. “My vision is of a safe, just and resilient Scotland where people can live their lives safe from crime, disorder, danger and harm. “We all have a part to play in making that vision a reality. If you witness a crime or are aware of criminal activity going on in your community report it, don’t leave it for someone else to report. Whether it’s housebreaking, cold calling or an attack, reporting it means that crime can be tackled and prevented. “Crimestoppers play an important part in that by providing a service where people can call to pass on information about crimes anonymously. By picking up the phone and contacting Crimestoppers you’re helping to prevent, detect and solve crime.